I've always messed with New Orleans . It's EASILY one of my favorite spots to visit. I went for the first time back in '98 when WEAA sent me and DJ Koz down for the Gavin Seminar and we had a ball! Between the music, the people (we got to link up with my 'lil sis Tra and her moms and Koz actually met his wife there) and the food (if you've been to New Orleans then you KNOW about the food) I have no idea how you could not love this city. It also didn't hurt that we flew in on the last day of Mardi Gras. After seeing what Katrina did to the city and the way that N.O. residents were born survivors throughout the entire ordeal only made me love the city THAT much more. 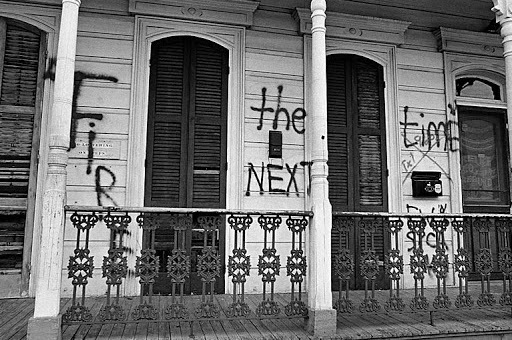 I've always wanted to do a documentary on the city but not like how Spike did with "When The Levees Broke" but a doc on the heart and soul of the residents and why the peoples of New Orleans came back. That's the most intriguing part for me because if a city gets hit by a hurricaine every year and you never really know how bad it can be and after seeing what Katrina did, there's no way I'm moving back! But a lot of people did and from the people I spoke with their answer was simple...New Orleans is my home. So while I was in N.O. for a conference for my gig, it was the perfect time to start getting some footage for my doc "Come Hell or High Water" and I gotta give a HUGE shout out to my 'lil sis Tra Boogie (a born and bred N.O. resident) for taking me around the city into Treme and the 9th ward so I was able to grab some dope footage and get some shots up of the "REAL" New Orleans. You know, the part of the city that 90% of tourist that come for Essence, the Super Bowl and Bourbon Street never see. So check out this "Chop Shop" piece, which is just a small portion of the footage I grabbed so cats could get a quick glimpse of what some of the 9th ward looks like, 7 years after Katrina hit.